The night started with local band Hostile. I'm not sure if they'n been a bit hostile to the lighting engineer earlier but he certainly didnt seem to like them, giving them some pretty appalling lighting. Happily though the sound was ok so we could enjoy their set. Loud and heavy, they got things off to a great start. They did a great cover of Judas Priest's 'Breaking the law' before performing a song written for them by Judas priest's KK Downing. Next up was Italian Power Metal band Kaledon. Sadly they too suffered from poor lighting, and also suffered from a really poor sound, with the vocals almost inaudible for the first couple of songs. Once the sound improved slightly then I started to enjoy their set, but the sound was never great and this made it hard to really enjoy it as much as I should have done. 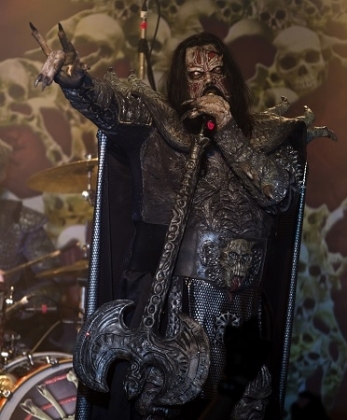 Finally came the headliners, Lordi. As the band came on they looked huge in their monster costumes, but the rest of the band were dwarfed when Mr Lordi came on stage at 7 or 8 foot tall. An imposing sight, they play some great heavy rock - the music would stand up on its own if they ever decided to ditch the costumes and play it straight. The costumes do however add an extra level of theatricallity - just like Alice Cooper's stage antics add to the overall experience. Not having seen Lordi before, I was surprised by the level of humour in the show - whether it's Mr Lordi's comments to the crowd between songs, or the keyboard player being put into a large doll box labelled Scarbie, or the giving of prizes and a winners sash to Mr Lordi duing "I'm the best". An extra touch was added during one song when two of the ladies from Nympherno came on stage and used angle grinders to fire sparks everywhere. For the last song of the encore, two more of the Nympherno crew came on stage and added a bit of extra heat as they started playing with fire and breathing fireballs. It was a great performance, and obviously included their Eurovision song, 'Hard rock hallelujah'. The set included half a dozen songs from their new album, 'To beast or not to beast' - they even opened the show with one, 'We're not bad for the kids (we're worse)'. The new songs go down just as well as the older songs which shows the strength of the new album. A great set - excellent music and a great performance from a band I definitely want to see again.